The rug looks great in my kitchen. Makes the whole room pop with the stainless steel appliances. Just the right size. Good quality. I would buy it again. Inspired by global travel and the bold, colorful motifs adorning fashionable ski chalets, Safavieh translates rustic lodge style into the supremely chic and easy-care Adirondack Collection. Crafted of enhanced polypropylene yarns, Adirondack rugs explore stylish over-dye and antiqued looks, making striking fashion statements in any room. Beautiful colors! Safavieh rugs are always well made. Absolutely beautiful rug!! Colors are exactly as pictured. Unique round shape and beautiful design make it a very classy statement piece. I used it for my living room paired it with gray walls and black trim. Very elegant !! This rug is beautiful and looks exactly like it appears on the website. Make sure you purchase something for under it if you do not want it to slide on non-carpet surfaces. The design and colors are great. The only reason I only gave it a 4 star is because it was a little thinner than I had hoped for. 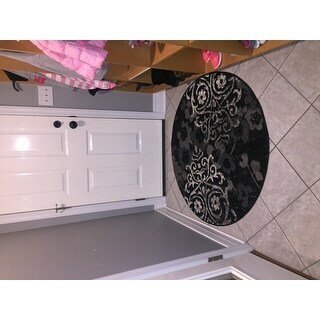 This rug fit perfect in my entryway and the colors work well with most color schemes. Easy to vacuum and pickup to mop as well. The rug was of acceptable quality and looked just like the photo. Perfect for under dinette table! "1)How is it to be cleaned?2)The description says it has latex, but later the specifications say no latex. Which is correct?" Routine vacuuming is the most important step in maintaining the life and beauty of your rug. It is recommended that you have area rugs professionally cleaned every 1-2 years to remove deep set dirt in high traffic areas. Otherwise, attentive vacuuming will significantly extend the life of area rugs.